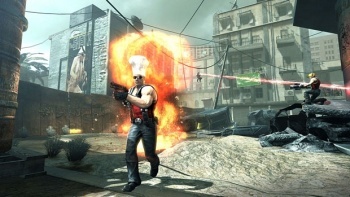 If you've ever had the urge to see Duke Nukem in a silly hat, this new DLC pack is for you. Duke Nukem fans rejoice, as 2K has announced the first DLC pack for Duke Nukem Forever, scheduled for release later in the year. Called the Hail to the Icons Parody Pack, the pack contains a number of new play modes, and well as new maps and weapons inspired by other popular shooter franchises. The DLC contains the Freeze Tag game mode, where players must co-operate to freeze and shatter their opponents, the Hot Potato mode, where players see who can hold on to the babe the longest, and the free-for-all Hail to the King mode. The pack also contains four new maps, each with a new weapon. The "Call of Duke" map is set in a war-torn city and features the "N00b T00b." The "Sandbox" map is exactly that: miniaturized Duke's fighting in a toy strewn sandbox with stick bombs, while the "Inferno" map riffs on Doom with lava, teleporters, and the "DFG." Finally, there's "2Forts1Bridge," which breaks out the miniguns, and looking at the screenshots, the novelty hats as well. The pack will be free to anyone who joined the First Access Club before the release of DNF. 2K doesn't explicitly say it in its release, but it seems a pretty safe bet that the pack will also be available for non-members at some point in the future. 2K is also holding multiplayer events at its office in Novato, California. You can click here to find out more details, although you have to be 17 or older to attend. As with anything so successful, the likes of Call of Duty and Team Fortress 2 are positively ripe for parody. But whether or not Duke Nukem Forever's efforts are actually any good is another matter entirely, as Duke's sense of humor has left a lot of people out in the cold. The Hail to the Icons Parody Pack comes out this fall.